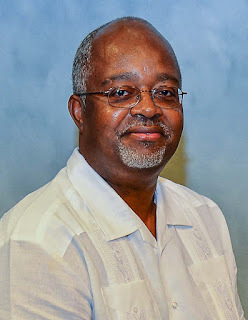 Dr. C. Reuben Walker was appointed interim Chancellor-Dean of the SU Ag Center and College of Agricultural, Family and Consumer Sciences by the Southern University Board of Supervisors on February 21, 2019. Baton Rouge, La. – The Southern University Board of Supervisors voted to approve Dr. C. Reuben Walker, Ph.D., as the interim Chancellor of the Southern University Agricultural Research and Extension Center (SU Ag Center) and Dean of the College of Agricultural, Family and Consumer Sciences. The position was approved on Thursday, February 21, 2019 during a regularly scheduled board meeting at Southern University Shreveport in Shreveport, La. For more than 30 years, Dr. Walker has been a professor of animal science at Southern University and A&M College. Prior to the appointment, Dr. Walker served as Associate Vice Chancellor for Strategic Initiatives, Auxiliary Services and External Affairs for the Southern University Ag Center and the College of Agriculture. He has also served as Associate Vice Chancellor for Research and Technology Development, Chairman of the Department of Agricultural Sciences, Chair of Agricultural Sciences and Urban Forestry, Southern University Baton Rouge campus’ Division Leader of Agricultural Sciences and Program Leader of Animal Science. Dr. Walker earned a bachelor’s degree in animal science from Louisiana Tech University and a Master’s and Ph.D. in Animal Science from Oregon State University. Dr. 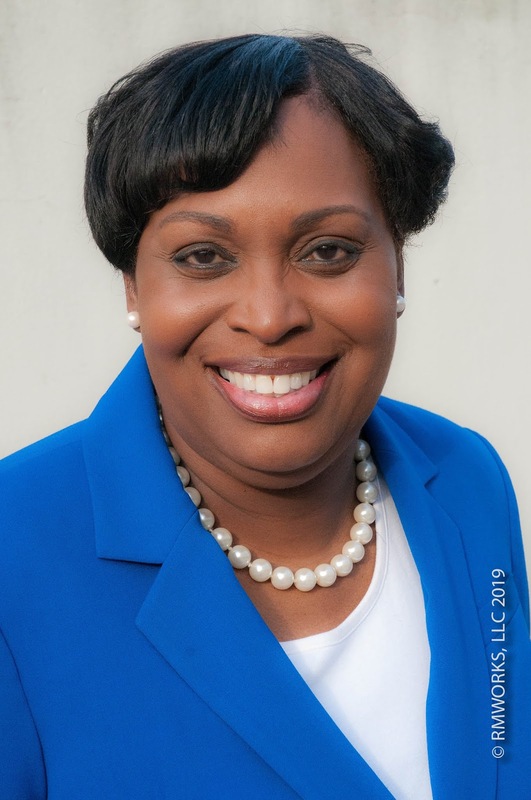 Dawn Mellion-Patin, has been named the 2019 T. M. Campbell Leadership Award recipient by Tuskegee University. Baton Rouge, La. – Dawn Mellion-Patin, Ph.D., Vice Chancellor for Extension and Outreach at the Southern University Ag Center, has been selected as the 2019 T. M. Campbell Leadership Award recipient by Tuskegee University’s Farmers Conference awards committee. The award is given each year during Tuskegee’s Farmers Conference Awards Luncheon in honor of Thomas Monroe Campbell, the first person appointed as an Extension Agent in the United States. To qualify for the award, recipients must exhibit professional and volunteer work, interact with 1890 Universities as well as other universities to impact Extension/Outreach, demonstrate involvement in public service activities to advance the quality of life for rural citizens and receive recognitions from peer groups for services rendered. In October, Patin received the 2018 George Washington Carver Distinguished Service Award from Iowa State University’s College of Agriculture and Life Sciences. Patin has served as the Vice Chancellor for Extension and Outreach at the SU Ag Center since 2016. She developed the Center’s Small Farmer Agricultural Leadership Training Institute, an intensive leadership development program that guides small, minority, socially-disadvantaged and limited-resource farmers through the process of becoming competitive agricultural entrepreneurs. Her work in the field of agriculture has provided her with the opportunity to serve as a panel manager for the United States Department of Agriculture (USDA); chair of the Southern Region- Agricultural and Natural Resources Program Leaders Committee; grant committee member for the USDA’s National Institute of Food and Agriculture (NIFA); 1890 representative on the National Extension Disaster Education Network Executive Committee and historian for the National Society of Minorities in Agricultural, Natural Resources and Related Sciences (MANRRS) organization. She earned a bachelor’s degree in Plant and Soil Sciences, a master’s degree in Educational Agriculture, both from Southern University, and a doctoral degree in Agricultural and Life Sciences Education from Iowa State University. Patin received the T. M. Campbell Leadership Award on February 21 during Tuskegee University’s 127th Annual Farmers Conference at the Doubletree Hotel in Montgomery, Alabama. Milagro Berhane, Senior Research Associate at the SU Ag Center, provides participants with instructions on how to plant tomato and watermelon seedlings during the Sustainable Agriculture and Rural Development Institute's Spring Garden Workshop. Baton Rouge, La. 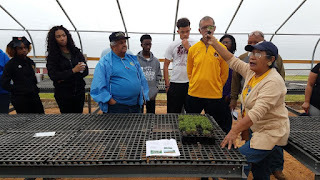 – Sixty small farmers, backyard gardeners and high school agricultural classes participated in the Sustainable Agriculture and Rural Development Institute’s (SARDI) Community Spring Garden Workshop on February 15. The event was held at 9 a.m. at SARDI’s Diesi Street location in Opelousas, La. Antonio Harris, SARDI’s Director, greeted the participants and introduced the workshop’s presenters Milagro Berhane, Senior Research Associate, and Stephanie Elwood, Extension Associate for Community and School Gardens, both with the Southern University Ag Center. Elwood provided participants with information on the importance of school and community gardens as well as information on nontraditional crops that can be planted in the Spring. 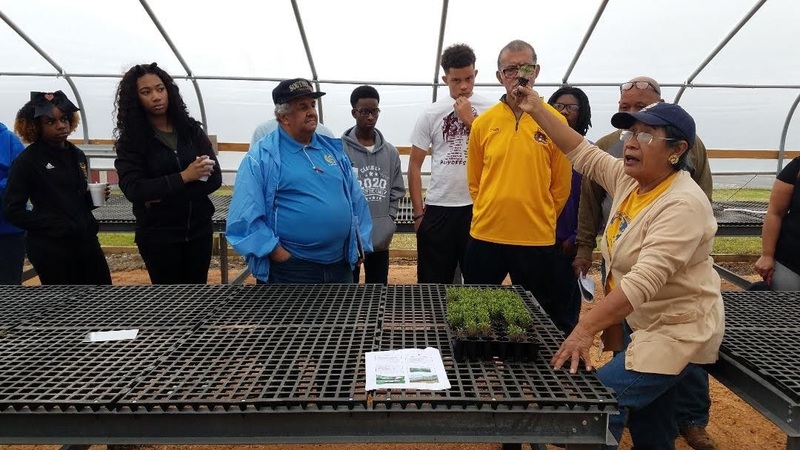 Berhane instructed the participants in hands-on demonstrations on seedling preparation, transplanting seedlings, and hoop house and greenhouse maintenance. During the demonstrations, each participant was able to plant their own tomato and watermelon seed that they were able to take home. SARDI is a satellite campus of the Southern University Ag Center housed in Opelousas, La. The Institute focuses on improving the socioeconomic well-being of citizens in rural communities within a ten-parish region of St. Landry, Acadia, Allen, Avoyelles, Beauregard, Evangeline, Lafayette, Pointe Coupee, St. Martin and Vermillion Parish. Standing from left, SU College of Ag alum and owner/CEO of Four Paws Pet Cremation Service, Lorenzo Bennet, presents a distal horse limb to Renita Marshall, DVM and Chair of the Department of Animal Science. Baton Rouge, La. 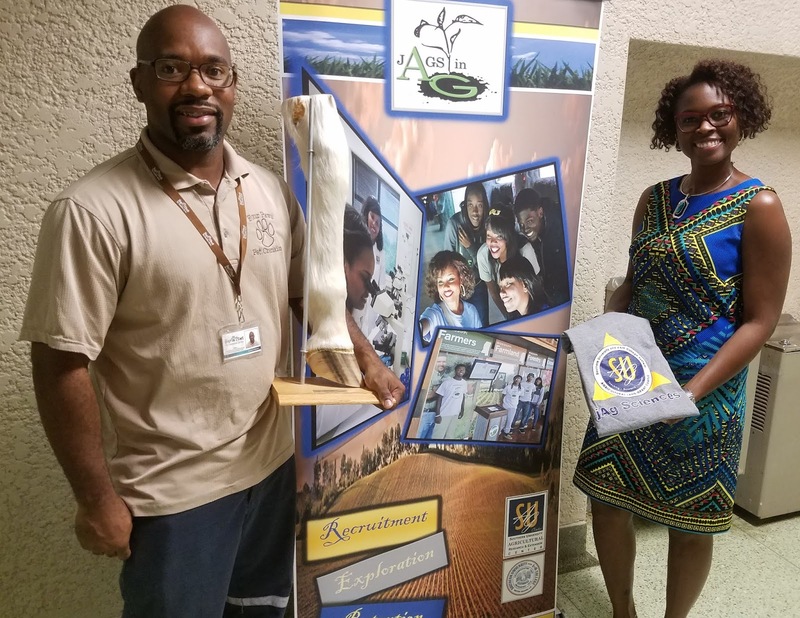 – Four Paws Pet Cremation Service has donated a distal horse limb to the Department of Agricultural Sciences in Southern University’s College of Agricultural, Family and Consumer Sciences. Lorenzo Bennet, an alum of the College and owner/CEO of the cremation service, presented the limb to Renita Marshall, DVM, Chair of the Department of Agricultural Sciences. Marshall said the limb will be used for student instruction. The department offers Bachelor of Science degrees in Agricultural Sciences with concentrations in Agri-business, Agricultural Economics, Animal Science, Plant and Soil Sciences, or Pre-Veterinary Medicine. For additional information about the Department of Agricultural Sciences, click here. Baton Rouge, La. 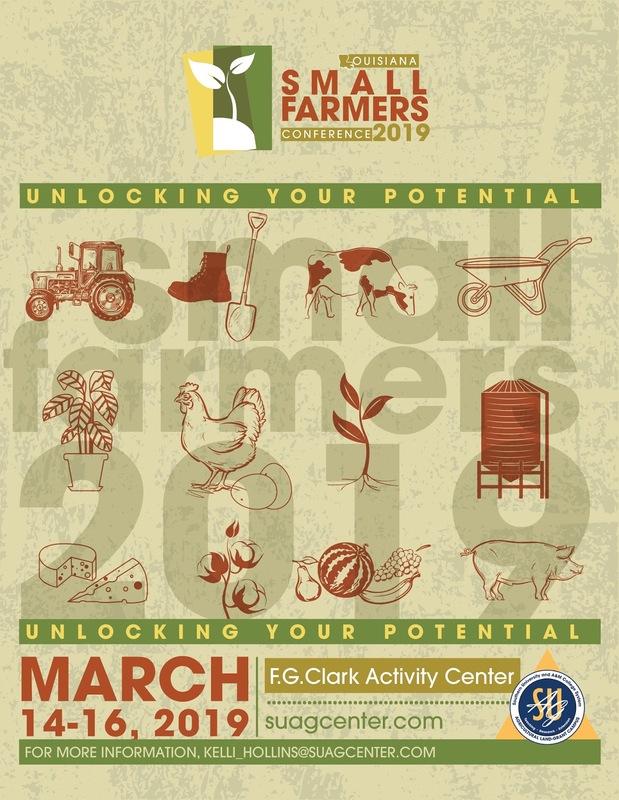 - Small farmers from throughout the state will gather at Southern University’s Felton G. Clark Activity Center from March 14-16 to attend the 9th annual Louisiana Small Farmer Conference. The three-day conference, themed “Louisiana Small Family Farms: Unlocking Your Potential,” is designed to educate, provide expanded awareness of educational opportunities, USDA programs and services and other resources to help small farmers stay in business. This event is the ideal venue for new and beginning farmers, small and urban farmers, agricultural business owners, community leaders, community based organizations, Urban Agriculturalists, Government Agencies and anyone interested in learning about agriculture. The conference will kick-off at 10 a.m. on March 14 with a grant writing session. The conference will also include a USDA Round Table Discussion on small farmer needs, an exhibit hall and the Louisiana Living Legends Banquet, which honors individuals who have made significant contributions to Southern University in the areas of Agriculture, Family and Consumer Sciences. The limited complimentary registration will end on February 28, 2019. After this date, the registration fee for the conference will be $100 for Agricultural Professionals and $75 for Small Farmers. Payment for the conference should be made in the form of check or money order made payable to: Southern University Foundation – ANR Programs. On-site registration will begin at 8 a.m. daily during the conference. Agricultural exhibitors are welcome. To register or to reserve an exhibitor space, click here or contact Zanetta Augustine at 225.771.2591 or via e-mail at zanetta_augustine@suagcenter.com.